Shotsgram is a Dribble app for iOS and Apple Watch that we wrote about back in 2015. It was intricately crafted and offered a lovely experience when browsing Dribble. Shotsgram was one of the best Dribbble apps out there for iOS and Apple Watch. The developers LittleBigCode have today released Version 2.0 of the app that introduces a redesigned UI to the app, along with a bunch of new features and improvements. Version 2.0 introduces a visual refresh to the app, getting rid of the dark tab bar & navigation bar, and replaces them with flat whites. Certain UI elements have also been updated, and are much nicer too look at now. This version also adds autoplaying GIFs to the app, which is a fantastic addition considering how many GIFs are posted on Dribbble these days. You also get the ability to 3D Touch on elements, Pinch to Zoom on shots, check the tags for each shot, view the color palette for shots, and a host of bug fixes. My favorite feature from the original version was its Timeline view. 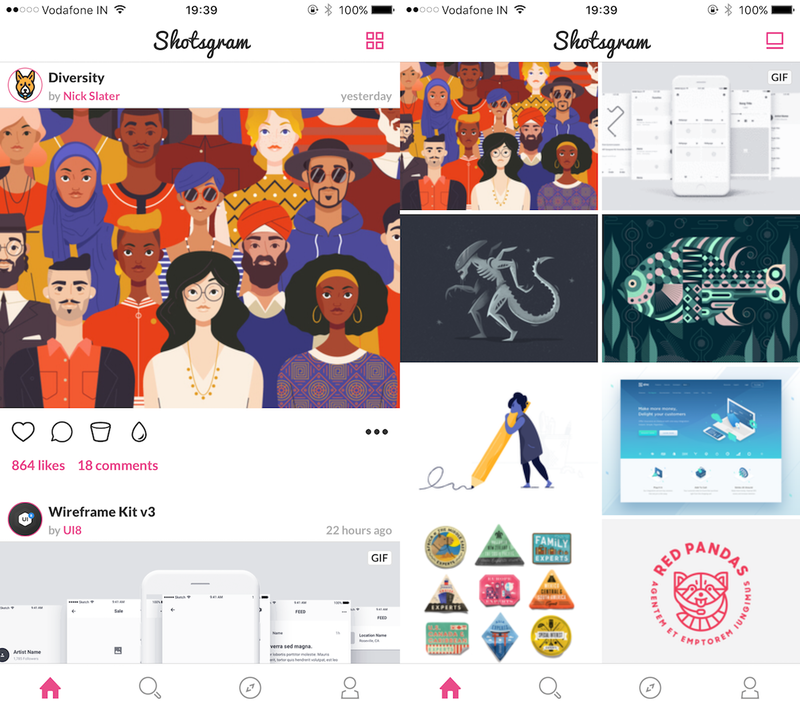 Unlike most other Dribbble apps out there that usually show a grid of thumbnails, Shotsgram makes use of a very familiar timeline of all the shots for a particular feed. There are four tabs at the bottom — Home, Search, Explore and Profile. The Home timeline displays a continuous scrolling vertical list of shots, with the title of the shot at the top, along with the user’s avatar and name. Below the image are buttons for liking, commenting and adding the shot to a bucket. With version 2.0, you now have the option to view a grid layout in the feed. So if you like seeing more content as you flip through the timeline, this option is now available. Shotsgram 2.0 comes just a month after the release of the official Dribbble app for iOS. This is a Free Update to existing users and the app is available Free on the App Store, with a $0.99 IAP to unlock the ability to connect your Dribbble account.